The ‘Iconic Australian Photography’ short story by the History Channel is now showing on Foxtel (channel 44) and via the NSW State Library’s website. 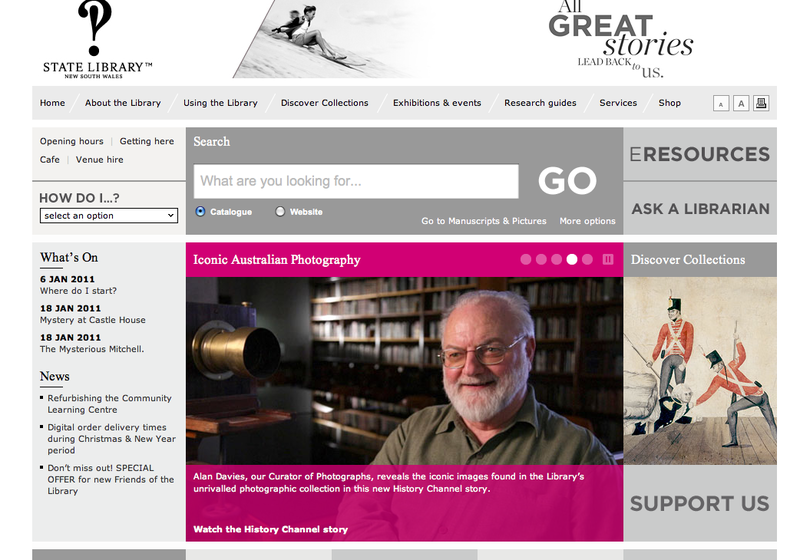 Curator of photography at the NSW State Library Alan Davies discusses the collection in a five minute video production. Alan discusses, a beautiful story, one that I had not heard before of two mates Max Dupain and Damien Parer. Alan also relays the story of discovering in a shoebox of negatives the photography of George Caddy and his photographs of Bondi Beach acrobatics from the 1930s and 40s. It is a brief outline of the workings of the library and it’s collection with it’s million plus photographs. Two of my own photographs flash before the screen for less than a second during the presentation. One a photograph I took of Australian Aboriginal runner Cathy Freeman as she realised the expectations of a nation winning gold in the 400 metre final at the Sydney 2000 Olympics . 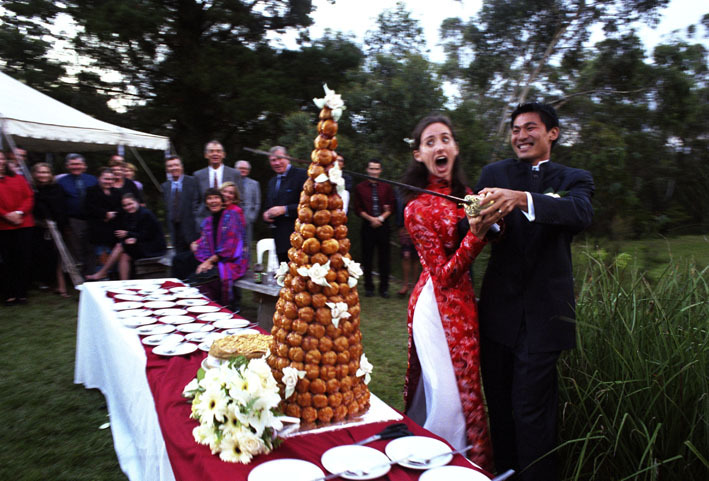 The second photograph I made as a guest of a friends wedding as the groom swiped the top of a profiterole wedding cake with a Naval College World War I ceremonial sword. 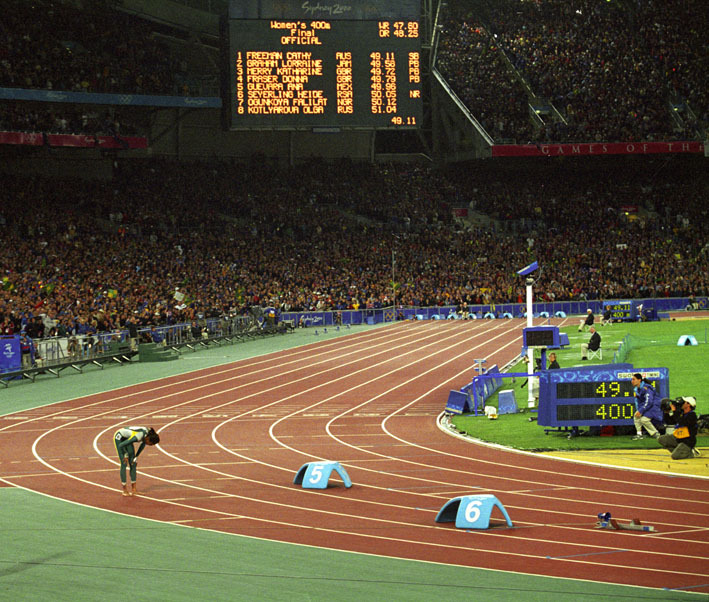 Cathy Freeman winning 400m at Sydney 2000 Olympics. The art director for TIME Pacific back in 2000 Susan Olle kindly hired me to photograph the two weeks of the Sydney Olympics. TIME pacific needed a specially accredited photographer of their own just in case at any time during the Olympics they needed a photographer to make a portrait, attend a demonstration, or photograph a particular person in an event. I was not really needed for the sports action, they had Joe McNally from the USA assigned and another photographer based in Russia. TIME had access to Allsport’s photographs (now Getty images). I photographed a different sport every day over the two weeks. I covered beach volleyball, rowing, swimming, the marathon, equestrian, kayaking and of course athletics. 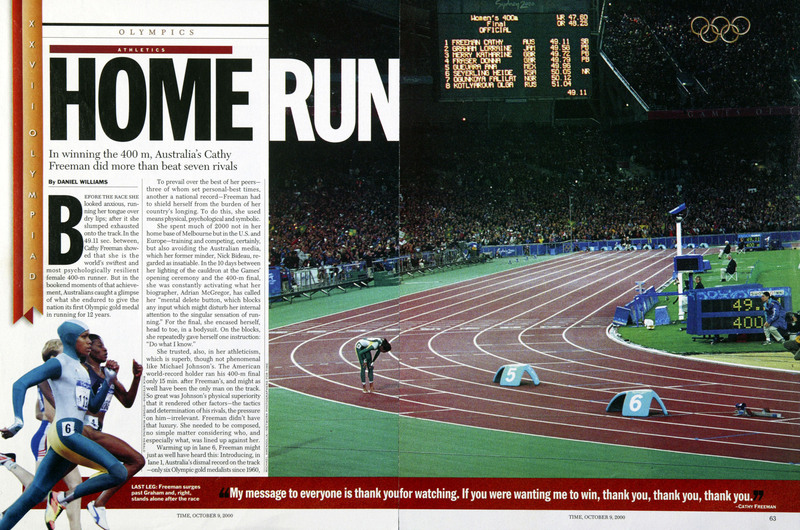 I remember very clearly just how much Australian expectation there was for Cathy Freeman to win the 400m. Australians wanted, actually needed her to win. Standing high up in the stand I had a very ordinary position facing the finish line with my 600 mm lens on my main camera and a 80-200 mm lens on the second camera using 400 ISO colour negative film. I photographed it because I just wanted to be there to watch history being made. Up in the stand I was with hundreds of photographers all elbow to elbow. After photographing most of the event with the long lens I switched to the 80-200 zoom and once she got up from the ground after sitting down for what seemed ages it could have been between 5-7 minutes I made photographs of her walking and waving to the crowd. In a number of frames I included in the picture the time of her run, the final places on the board, I composed her very small in scale to the enormous crowd. I have had many positive comments from writers on this photograph none from photographers. It is not a photographers photograph, it is a historian’s photograph, it is all about time and place. TIME Pacific published it across two pages as the opener to the coverage that week and some seven or so years later Alan Davies purchased the photograph for the NSW State library archive in 2004, one of twenty or so I have with the library. This Cathy Freeman photograph was one of a number of images I selected for the final edit of the games. It was Susan who actually spotted the image and considered it as some thing special amongst perhaps twenty or so photographs of the Cathy Freeman race. Susan chose it for the magazines opener for that weeks coverage otherwise the photograph may have passed by any notice in the busyness and stress of the time. Felicity and Dat’s wedding in contrast was not work. I just took some photographs for a close friend’s wedding. When you are not commissioned you can do what you want. I actually like photographing weddings, especially when I can work in a documentary style. At some quiet time in the proceedings, usually after the ceremony I make some portraits of the couple and their family, an image to put in a frame where the couple are at their best and the photographs reflect a sense of place. In this case I had the camera-lens combination I always used to loved when I was using film, a 28-70 mm Zoom on a Canon SLR and a 35 mm on my Leica rangefinder camera. It was time to cut the cake and as I waited to document the event Dat lifted the sword and just took a swipe at the top of the cake I instinctively lifted the camera and took the photograph. I must have pre focused without thinking about it as the photograph was nice and sharp, a little movement although that added to the energy of the image. It happened so quickly I had no time to think, I just did it. Alan purchased this photograph for the library and it along with the Cathy Freeman photograph. Some year latter they featured in the book on the collection the library published in 2004 called Eye for Photography. The key for photographs presented to the library is, their information and their historical significance. It’s nice to have a few photographs in the archive at NSW State Library. Michael Amendolia Assignment Photographer -Visual Communications material for publications and organisations, in print and on the web. Telling a story with photographs has been my profession and passion and for over 25 years. I now run a small photography business working with Australian and International organizations and magazines. My experience is photographing people across the spectrum of life, on location. Contemporary environmental portrait, documentary and landscape. On some assignments I now make some video along side my still photographs for multimedia purposes.